This is a recipe from Foof! 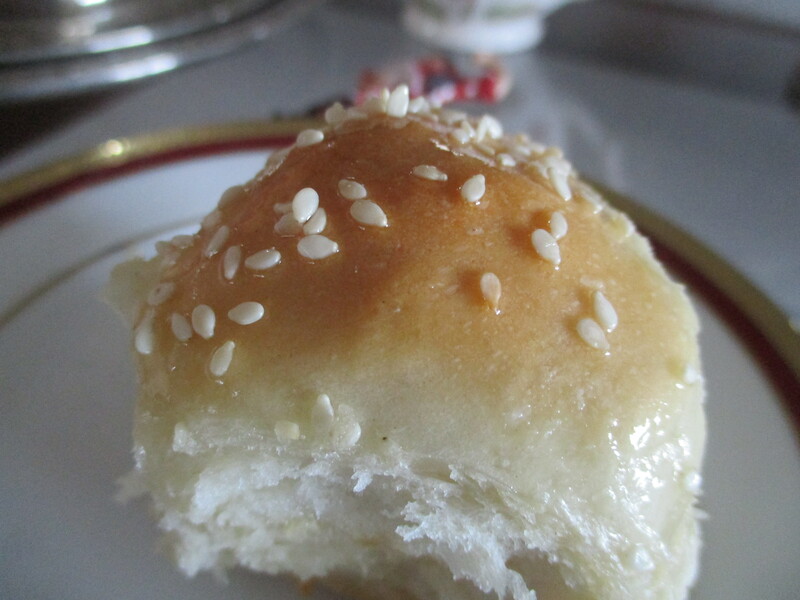 These yummy little bundles of bread filled with cheese are found in neighborhood bakeries throughout Saudi Arabia. I have never seen them in Syria so I am not sure of their origin. A basic dough is put together, left to rest for 60 minutes and then small pieces of dough are flattened, filled with cheese and rolled into a ball shape. We added a little twist to tradition and put feta cheese in the middle of some balls instead of cream cheese. You can chose which cheese you prefer. The balls are sprinkled with sesame seeds, baked to golden perfection and finally topped with a light warm syrup. We use a round cake pan and it has worked well for the amount of dough and the desired shape. Grease pan. Pinch off pieces of dough and flatten in hand, place a spoon of feta or cream cheese in the middle, roll up into a ball making sure they are well sealed. Put each ball seam side down (if there is a seam or bunched up area) in the cake pan leaving a little space in between each one. Sprinkle sesame seeds on top and put in the oven. Bake approximately 30 minutes until bread is done and brown on top. While rolls are baking make syrup. Place water and sugar in small sauce pan and let this mixture come to a boil, turn it down but keep it on a low simmer/boil. Watch this mixture carefully because it can cause a huge mess if it is left for too long or it can become too hard to use. After ten minutes remove from heat. Try to time the baking of the rolls and making the syrup so that the syrup is still warm when the rolls are done. When the rolls are removed from the oven, pour prepared syrup over the top, allowing to soak in. Rolls will be hot so be careful! Following in her mamas footsteps! Look yummy!!!! Oh these are so good! My grandson goes to Nursery School with several children from Syria and yesterday one of the boys shared one of these with him. He talked about it all night! Thanks so much Suzanne! Do you know where Cheryl is? I cannot find her email and am worried about her! YUM! Nothing like fresh bread/buns! They are pretty yummy Sarah, thanks! I would love a few of those as a snack right now!! I’ll be making these, Lynn. They look and sound wonderful! Saved these to make with the kids over our next break! Yummy! They are pretty yummy and yes I can see your kids really liking them! That sounds very good, Lynn! It gives me a lunch idea! Thank you so much for the inspiration, Lynn!! These are lovely little buns. I like the idea of using feta as well as cream cheese. Thanks. Yummy!! Can Foof fly out here to FL, please!! This buns look so appetizing and delicious. Lynz mam check out my new blog. Pls follow and share this blog. Those sound and look delicious! The giant sundae at the top with your daughter looks HUGE and yummy too. Making bun and bread is so satisfying. I can smell them cooking through my screen, lol! These look heavenly. I can smell them from here…..yum!!! Sounds wonderful. Pictures make you want some. I’m good at eating, but not good at cooking. Yummy! It looks delicious! Thanks for sharing!